A professional Vibrational Sound Therapy Session will drop you into a deep relaxation, and gently stimulate every cell in your body with cleansing vibrations from our hand-made therapy bowls. Imagine yourself lying on a massage table, warm and comfortable. Our Vibrational Sound Therapist gently places bowls on, and around you. As the bowls are lightly struck, your mind drifts to the delicate, naturally soothing sounds. The bottom of each bowl sends vibrations through your body releasing tension. They are moved periodically, to the shoulders, back, lumbar & legs, to more directly stimulate a release of tension. At then end, you sit up, refreshed, mentally bright and physically relaxed. Employees LOVE our Sound Therapy offerings. You are invited to explore the collection of hand hammered bowls and choose a face up or face down session. 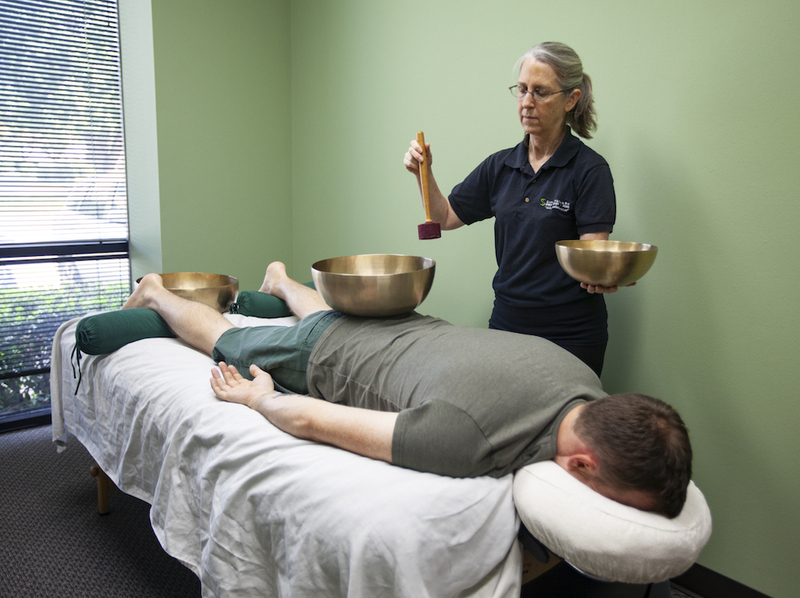 The VST Certified Practitioner then walks you through the protocol by placing the bowls on the body so you gain familiarity and comfort. Because the goal is deep relaxation, you are offered a blanket, bolster, eye cover anything to help with comfort and your sense of security. The VST Certified Practitioner then begins your chosen Sounding Protocol. Sounding Sessions are offered in 30 or 60 minute lengths with various bowls being placed on the body and lightly tapped in a slow, gentle sequence. The vibrations sink deep into the tissues while the sounds sink deeply into the heart and mind. Follow up appointments can be customized in duration, bowl selection and body placement to create a truly unique experience, Or simply leave it up to the professionals. Since the goal is deep relaxation, in a safe, comfortable environment, you are completely in charge of this experience. Nature does not typically create pure sound frequencies. The unique imperfections found in hand hammered bowls allow a complex array of over and under tones to be present which the human mind finds soothing. This encourages the mind to sink into a deeply relaxed, theta state. Do you use Gongs or Crystal Bowls? No. While they may have their place, we know that sudden, loud, jolting or sharp noises trigger the sympathetic nervous system (fight or flight) which is the opposite of what we want to achieve during a session. Our goal is to release all points of stress and allow the mind to drop into a restful, deeply relaxed state. We also know that sound travels much faster through fluids than air. Combine these facts and you have a therapeutic practice which stimulates the human body on an intracellular level, Patients frequently report feeling "tingly all over" after a bowl session. Humans experience five different types of electrical patterns or “brain waves” which are measured in Hertz. (cycles per second) Each serves a specific purpose in human functioning. In order for us to function optimally, we need to have a "balanced dose" of these frequencies. Increases learning, memory and information processing. The beauty of hand hammered bowls is they deliver layers of sound with each strike. This complex, yet soothing "sound bath" causes the brain to process the layers of sound binaurally which evokes a reduction in brainwave frequency. The lower the frequency of the brain, the deeper the relaxation. Of the three levels of human interaction with sound and vibrations, emotions are the most familiar to us. Hear a favorite song and we smile from the heart; hear a loud crash and we are jolted with fear. A soothing vibration comforts while a rattling vibration disrupts. Certified Vibrational Sound Therapists us the Measured Strike Technique which eliminates the "surprise strike" or accidental "clang" which would jolt you right out of your relaxed state. When the body relaxes, and the mind becomes quiet, the emotions settle. It is from this place of peace that the deepest healing can occur. Recently, western science has begun to confirm long held beliefs that sound has the power to influence all forms of matter. We have seen sound used to identify birth defects, the gender of an unborn child, locate ships or even small fish in the vast open water. There is even a machine which can boil water using nothing but sound waves. Through the power of sound we can feel alarmed, excited, angry, relaxed or even love. Often called Tibetan Singing Bowls, they do not actually originate from Tibet, and were not designed as the sound instruments we see today. In truth, they originate in form and function as food and cooking containers. 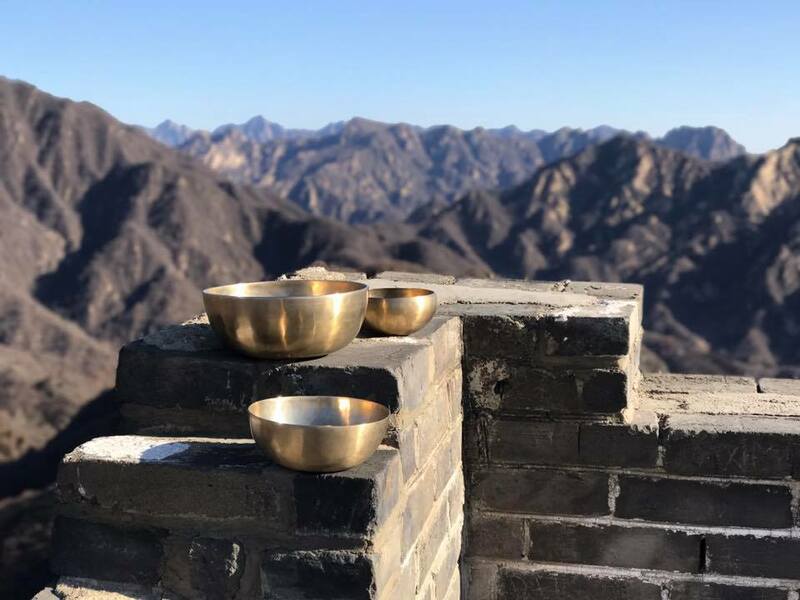 However, the real power of these unique, hand made, brass bowls is in their ability to deliver deep vibrations to relax the body and complex harmonic signatures which soothes the mind like nothing else can. Our store carries only the finest, hand selected, humanely sourced, factory direct bowls guaranteed to make you smile. Our SimplyAware Wellness & Training Center Members enjoy a year-round discount.